It’s well established that older men are more likely to pass on a genetic disorder to their offspring, but we’re learning more about why this happens: As men age, their sperm mutates more frequently. This is bad news for men who want to have children later in life. Researchers from Oxford University have discovered that tumor-like sperm cell mutations—called “selfish” mutations—get more common as men age. Certain mutations in sperm cells, though rare in early life, proliferate over time, resulting in a cascade effect that results in more of these problematic sperm later on. Typically, a man has a four in 200 chance of passing down a genetic disorder to his children, but after the age of 50, that number jumps to five in 200. The new study now appears in PNAS. For the study, the researchers analyzed 14 testicles from men aged 39 to 90. Each testis, which the researchers described as “a massive tangle of spaghetti,” contains up to 1,310 feet (400 meters) of interwoven tubes in which the sperm are produced. To identify the growths of mutant cells within this extensive network of tubules, the researchers used a laser-powered microscope. A subsequent genetic analysis identified the selfish mutations in 13 of the 14 testicles. These defective zones were linked to a range of bodily processes, including a predisposition to cancer and the aforementioned role in defective sperm growth and reproduction. Sperm are produced when spermatogonia, a critical cell required for sperm production, divides into two; one of the new cells goes on to make sperm, while the other remains as spermatogonia so that it can repeat the cycle. 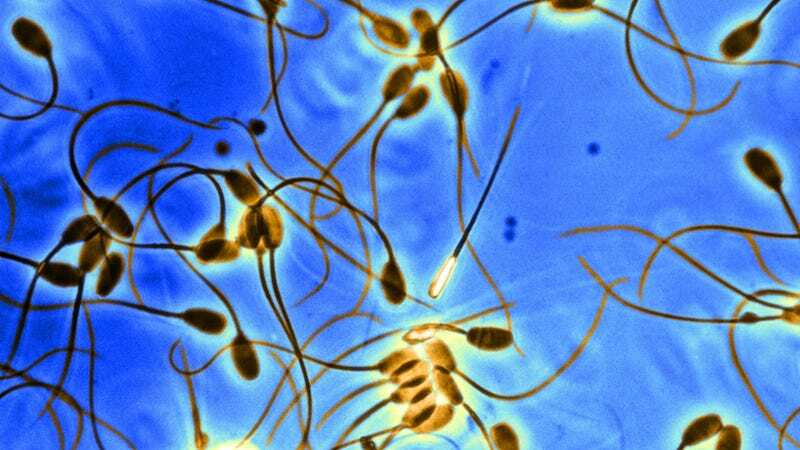 Men produce millions of sperm each day, but they’re not all perfect. Copying errors result in defective spermatogonia, and subsequently defective sperm. Some of these mutations, including a defect in the FGFR2 gene, enables spermatogonia to produce not just sperm, but extra copies of themselves. This “gain of function” allows the defective spermatogonia to reproduce and spread faster than the surrounding normal spermatogonia. So as a man gets older, he collects more growths of this defective spermatogonia, which increases his chances of passing on a genetic disorder—including those that don’t affect him. This would explain why some children with genetic disorders, like most children with Apert Syndrome (a disorder affecting the development of skull and limbs), are born to unaffected parents. As a man ages, his mutated selfish spermatogonia starts to accumulate in his testes. Not only do the resulting defective sperm carry disease-causing mutations, these same mutations also confer a competitive advantage to the defective spermatogonia. “In essence, all men will develop these mutant growths within their testicles as they age, and with the trend for delayed parenthood, it is important that we understand the potential risks associated,” noted the researchers in an Oxford University press statement. In addition to disorders like Apert Syndrome, this research could explain why older dads are more likely to have children with schizophrenia, autism, and possibly even Down’s Syndrome.